Helicopter hand draws for you Last week I explained how when trying to make controlled lines with a brush, you need to keep the brush handle vertically oriented, and that to change the line width you should hold the brush higher or lower rather than pressing harder or softer. 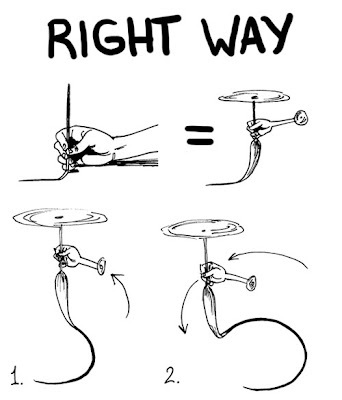 I said that for newcomers to the brush, who come from a background using markers or nibs to ink, a good way to get their hand used to this new way of moving is to think of your hand as a helicopter hovering above the paper. I was going to illustrate that metaphor, but I was sick last week and didn't have the energy. But I think seeing it illustrated will help brush virgins to understand both the metaphor and to understand some of the problems they may be having with the brush. 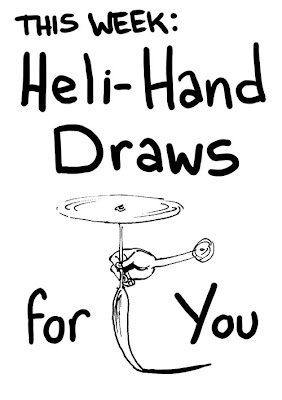 Below is an illustration of my hand holding my brush, and of my hand as Hand-copter. In the below illustration Hand-copter makes a circle with a consistant line by maintaining the correct altitude and hovering in a circle. The bristles of the brush trail behind in a smooth, even curve, producing the line Hand-copter wants. To move the brush, you must lock your hand and move your arm instead. This is why when I use a brush for too long I get shoulder pain instead of hand pain. Unless I'm doing some sort of wild hatching or drybrush effect, my hand isn't doing anything except hold the brush slightly higher or lower. 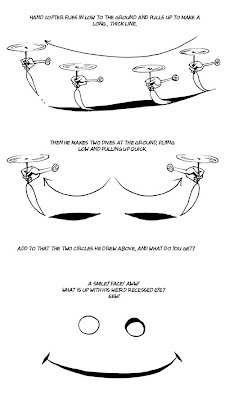 Here's Hand-copter trying to draw the same circle but doing it as if it was a person holding a marker or pen nib, like most beginners are used to. You can see that allowing the handle to press on the bristles at any sort of angle will twist them and bend them like a spring, and when you come around a tight curve that spring will release, causing all sorts of uncontrolled havoc. As long as the brush is held vertically, you can maintain a controlled line in any gesture, pretty much regardless of speed. I ink like greased lightning with a brush on everything but the most technical of drawings, and it's generally a fact that someone who is good with a brush can ink a page faster than someone of equal skill using a pen. Learning to use the brush is slow and very difficult, but once mastered it's a tool of speed and spontaneity. 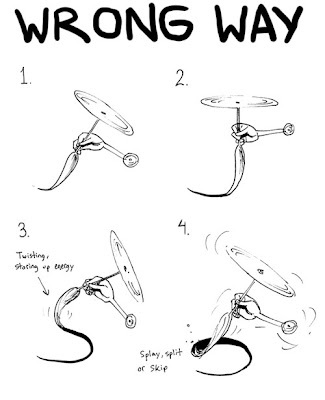 And now, Hand-copter will draw you a picture using the principles I've discussed. Click on the image to enlarge. Maybe heli-hand can ink some of my comic for me? I'm so behind! Hey, is this Sabin as in drawing-night-and-Stumptown Sabin? I just found your site. I'm a helicopter pilot in addition to being an artist, so this metaphor was perfect for me! So what you're saying is you're the coolest person on earth?